1. Made of 600D heavy duty fabric with 100% waterproof coating. 3. Protect your cooler bins from rain, snow, UV rays, dust, tree sap and birds. 4. With ventilated structure, and 2 padded handles at both sides for easy install and remove. 5. Elastic hem cord and bottom strap for custom secure fit, especially during high winds and severe weather. When you buy a Porch Shield cover, you are not just getting a cover; you're also purchasing peace of mind. A customer favorite for the design, practicability, durability and high quality items with great price. Not only will your patio furniture be protected from the elements, but you'll be protected with the easiest warranty in the industry. If your product fails within the warranty period, please feel free to email us. We will arrange replacement or refund for you asap. 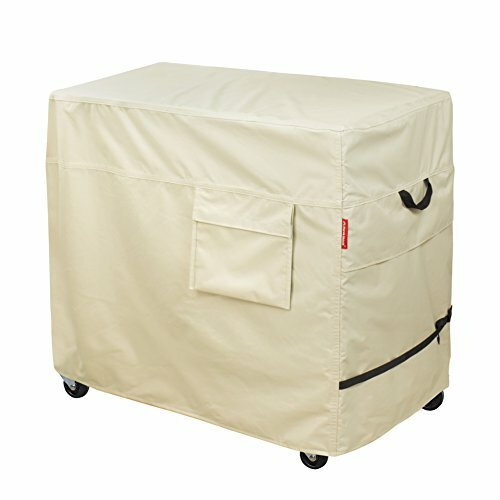 Cooler cart cover is made of 600D durable polyester fabric with an added water-resistant laminated under coating. Cover dimension: 34 x 20 x 32 inch. 3 Year Warranty. Water-resistant backing keeps your Ice Chest completely dry. And full cover with seam sealing tape make it 100% waterproof and dustproof for enhanced durability. ideal for outdoor use. Structured air vents at two sides stay open to prevent wind lofting and mildew, and are lined with mesh barriers. Waterproof, and Ventilated. The heavy duty ribbon weaving on air vents make removal easy, while double-stitched seams add strength. With a large capacity tool pocket perfect for storage bottle opener, ice scoop, and other accessories. If you have any questions about this product by Porch Shield, contact us by completing and submitting the form below. If you are looking for a specif part number, please include it with your message.